Before you start building or planting toward the margins of your property, head off disputes with the folks next door by first figuring out where your space begins and ends. Good fences may make good neighbors, but accidentally erecting one on a neighbor’s property can lead to hard feelings, or even a lawsuit. Whether you want to build an addition, figure out who’s responsible for tree removal, or plant a border hedge, you need to know where your yard legally ends and the next guy’s begins. Here, we’ve put together the most common methods for figuring this out. Some are simple and inexpensive, adequate for satisfying your curiosity. Others demand skills and will cost a few bucks, but may be necessary for certain construction projects. Read on to learn how to walk the line—and ensure that your house and landscaping stay on your side of it. Examine the lines that are cut in the sidewalk in front of your house. Often, the contractor who poured the sidewalk started and stopped on the property lines, so those cut lines may coincide with the edges of your property. As well, the appearance of the concrete on your side of the property may be slightly different from that on your neighbor’s side. Streetlights, too, are often placed on property lines. While these visual clues are good indications of property lines, if you intend to build or install something on your land, you’ll need additional verification. The zoning department is the municipal office that records plats: the maps, drawn to scale, that show land division. Unless your home was built more than a hundred years ago, you can probably obtain a copy of your block and lot plat for a minimal fee. This will give you the exact dimensions of your lot—in other words, the property you legally own—in relationship to other lots on your block. When the surveyors were laying out the original plat, they determined a starting point for all the lots on your block. You can retrace the original surveyor’s steps by locating the starting point, which will be labeled on the plat as either the “common point” or the “point of beginning” (POB). It is often the center point of a side street. The original surveyor’s measurements will all be listed on the plat. With a long measuring tape, follow the plat as you would a treasure map, measuring your physical property as you go. Your measurements should correspond with the ones on the plat. Survey pins are thin iron bars, two to three feet long and sometimes capped with plastic, which the original survey crew inserted on the property lines. If you have access to a metal detector, move the device over the ground along the sidewalk to the curb to locate the survey pin. Pins may be buried just under the surface, or up to a foot below. A few days before you dig, however, you must call 811, the free, federally designated number that will route you to your local utility company. Ask the utility company to come out and mark any buried lines so you don’t unintentionally hit one. There’s no charge for this service, but if you damage a buried utility line, you could end up having to pay to repair it. Survey pins are not foolproof markers. Over the years, previous owners, utility workers, or even a tree-removal company may have dug up a survey pin and reinserted it nearby, or just tossed it aside. Your actual property line, however, does not change just because someone messed with the survey pin. 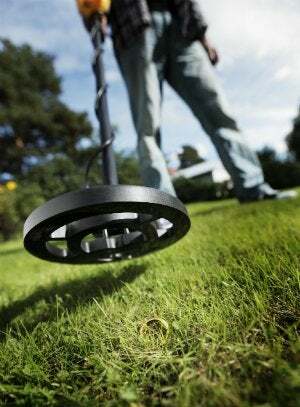 For example, if you locate survey pins 60 feet apart on opposite sides of your property but the plat says your lot is 50 feet wide, one of those pins may have been moved, and your property is still just 50 feet across. In older neighborhoods, property owners may have purchased or sold off portions of their yards. Locating a survey pin won’t give you this information, but the most recent legal description recorded on your deed will list any such changes. If you don’t have a copy of your deed filed with your homeowner records, get one at the register of deeds office, often located within your county courthouse. If your deed features a metes and bounds survey—a survey that describes the exact distances and directions from one established point on your property line to the next—you’ll have all the information you need to locate your property lines. Unfortunately, this type of legal description is notoriously difficult to comprehend unless you’re a surveyor. The metes and bounds survey cites a starting point, located at one of corners of your property. From there, the survey will give you detailed directions and distances to help you locate the rest of the corners and boundary lines of your property. It’s similar to a connect-the-dots game, except you do it on foot, not on paper. You’ll need a long measuring tape as well as a good-quality directional compass so you can move systematically from point to point. But egad! You’ll find that a metes and bounds survey reads like a Shakespearean play. A typical survey may tell you to “commence” from the point of beginning (POB), “running thence westerly 100 feet, thence southerly at an interior angle of 55 degrees to a point,” and so on until it brings you back to the original starting point. Before you drive yourself too crazy with the metes and bounds survey, know that the only legally binding method to determine exact property lines—essential, for example, if you intend to build an addition to your house—is to have a professional survey. Local building codes will determine how close to your property line you can legally build. A professional survey could cost from a few hundred to more than a thousand dollars, depending on the size of your property and the complexity of the survey. Costly, perhaps, but adding to your dream house while keeping in your neighbors’ good graces is priceless.